Let me introduce you to some of my Indie friends.From left to right we have Francis Grillo, Roslyn Johnson, Eva Stuglovics Melissa Rivera, Kim Allen, me, Patricia Robbins, Sue Nadel Stephanie Bismuth, and Delores Harris. Aren’t we a great looking bunch?? 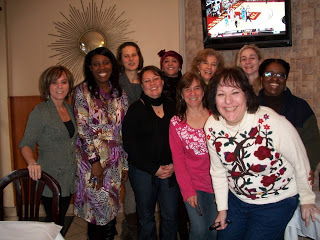 We are all members of the Indie Business Network and we try to get together once a month to eat, laugh and talk soap. Now for the questions. Why am I friends with other soap makers? I love talking soap with others who share my passion. I learn so much from them. Aren’t we competitors? Yes and not really. What do we do when we see each other? Besides the usual girl talk, we chat about classes we are taking, fairs we are attending, products we are making, and problems we are having. And here is the big one. Why do I talk and share with my competitors? Shouldn’t I keep all my information to myself? Why do I want to help any of them? Well, if I thought like that I would not have found the sense of community I have with these women. We help each other out by sharing our resources and supporting one another. If I run out of cocoa butter, I know I can call Roslyn and buy some from her until my order comes in. When I got my first wholesale order, I called Pat to give me some pointers and a pep talk. Sue was the one I wanted to smell the natural perfumes I created, since she has a great “nose”. And best of all, we can place orders for ingredients together, saving all of us (and our customers) money. Isn’t this an unusual way to run a business? Maybe, but I wouldn’t have it any other way. Thanks Ladies! !